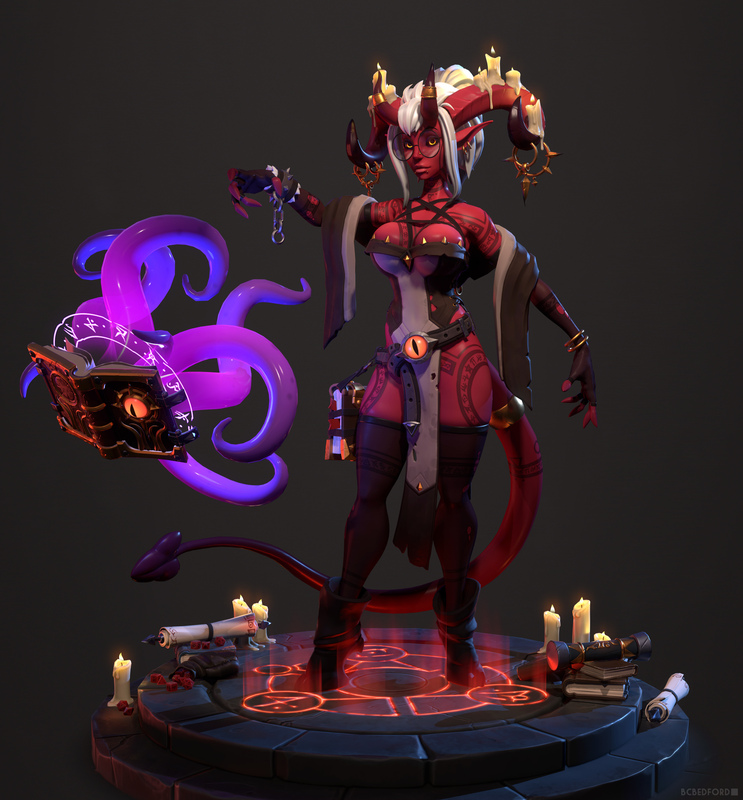 Meet Ezri, the Literati Succubi! Just wanted to add a few more images to the top here, but I'll leave my actual Mar. 5th final entry alone. I wasn't quite happy with the final render layouts so I fixed a couple errors and put together few extras shortly after submitting. More at the end of the thread. Right, so on to the character herself! For this challenge, I'd like to take on the subject of demons...but perhaps with a bit of a twist. All armies need an R&D department, even an army of darkness. So I'd like to introduce you to my Librarian Demoness, Ezri - succubus book-keeper, corrupted loremaster, and hellion researcher. Our little hell-spawn here began her life centuries ago as a devoted scholar of lore for the Light, but perhaps got a bit side-tracked somewhere along the way. It is said that those who spend their days in an endless quest for knowledge will inevitably uncover secrets. Delve too deeply into those forbidden secrets, you might find yourself faced with the Dark. And those few who study the Dark for too long... are doomed to become a part of it, corrupted eternally by the journey into the void. I'm not 100% sure on style, but my personal preference will always swing more towards stylization. Guess I'll figure that out as we go. Yeeeeeaaaah! Super excited to see you do this challenge! @alemja Thanks Alexandra! I've been really terrible about legit finishing any recent projects, but I'm in-between gigs at the moment...so now I really don't have an excuse. Onward to base meshes and concepts! This sounds really interesting. Can't wait to see some sketches or block out. Alright, the holidays provide a brief distraction, but let's keep the ball rollin'! Just some color variations. I'm heading towards the classic red (A), but I thought I'd throw up the other two top contenders from a demonic rainbow of about 15 colors. And something fun for last. 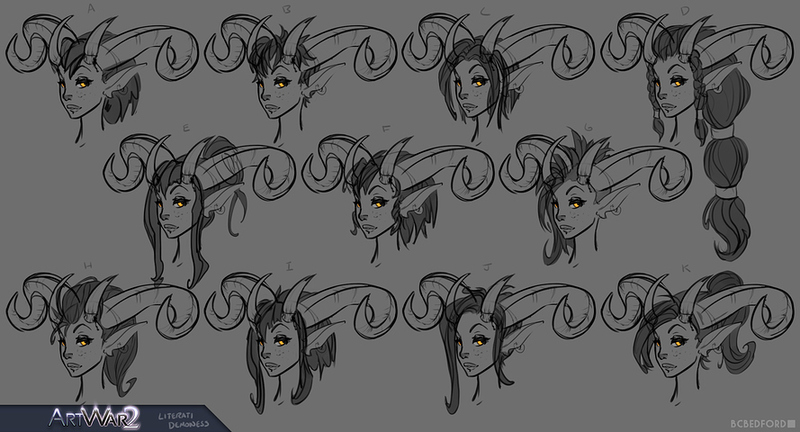 What's a succubus concept for if not to mess around with bewbiez shapes? I'm leaning towards B here...but E makes for such a silly exaggerated look, it may actually win the day. We'll see in 3D. I need another quick pass on her hair and horns as I'm still not sure where they're landing. But I need to get her body rollin' and get some of the props blocked out. I think it can really help you push your design! With C bewbiez she has chance to became the cutest female character on this competition.. good luck. Still working on her base body, but in the meantime I took a break to rough out some hair ideas...only to realize I kinda liked what I originally sketched out (A/F). Go figure. E is definitely a keeper though - might try it out in 3D. @alemja Oooo man, those Instagram accounts have some great reference! I've seen some of those pieces in costuming boards, but the source is fantastic. I think some of the weakness of my design may be more a fault of less than stellar concepting skills. My thought was that much of her 'dress' is actually what little remains of her old librarian outfit, something more akin to a novice mage or book-keeper rather than true fetish-wear. My intention is actually to keep her outfit fairly simplistic so the focus remains on her overall read, but there is certainly room for some detailing. There's already a few things I saw in Sharon Ehman's work that I'd like to add - thank you! @baby_let_me_hold_you Hah, thanks man! They're all pretty fun honestly - looking forward to seeing how they translate into 3D. 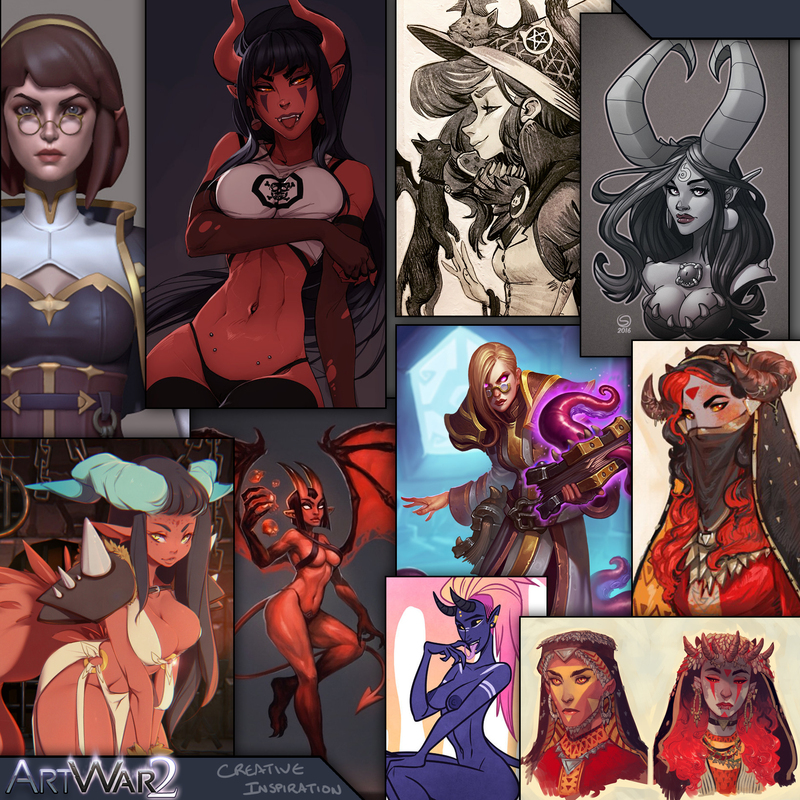 Last 'concept' update, I swear! Just nailing down a few more of the lingering question marks, but I'm gonna call this done for now. I just don't have the 2D art chops to attempt a full concept. Sculpts coming soon! Very cool concept and really nice curves! I look forward to the sculpt. As far as the concept goes, I like it. It looks really cool. Lots of nice details and cool design elements. As far as hair goes, I think E is a nice choice but it seems you went with A already. lordy lord lord... please forgive my sins......... haha looking awesome!!!!! So good! The narrow shaped glasses fits her outfit more, I think. Can't wait to see the sculpt. Alright, with the holidays done, time to get moving. Block-out took me a bit longer than I would have liked to get her heading in a direction I like, but landing closer here. There's a number of anatomy issues I have to deal with in the torso/chest/back, but I'll through work those while exiting the dynamesh phase. On to hands, wings, and blocking in clothing. The anatomy fixes shouldn't be to hard. Just need reference. Hopefully you can capture a little more of the curves that you see in the concept, but, I believe in your skills.. Other than that, nice start. The boots/feet looks good so far and l like the shapes of the horns. Quick question, how did you do the eyelashes? Did you mask then extract? They look nice. I don't know why, but I'm struggling to get nice eyelashes. @malcom Thanks mate! I'm definitely in the process of refining her base as much as possible before throwing on her outfit. I threw together a quick tutorial image for just that question. I should probably do a larger breakdown, but I think this should get you up and running. - Drop my draw size to 1 so it creates a flat plane. - Split that new plane and generate the 'volume' using Panel Loops. - After that it's just a matter of smooshing around the lowpoly shape of the eyelash and sub-divide. Thanks a lot. this should help. Thanks for the tip along with a break down . Busted out a little more refining progress last night and I'm pretty happy with her direction so far. Please feel free to call out any suggestions or weirdness you see. Still got a lot of work ahead and I really need to stop procrastinating on her props, clothing, and perhaps a base to lounge on. Also if I had 1 more thing to say, it would be to work on the abs a bit more. Not sure. It is a stylized character.